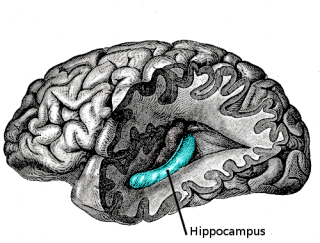 The Hippocampus: critical to forming new memories: image via Wikipedia.com If you're having trouble remembering where you parked your car or put your keys and refer to these occasions as 'senior moments,' you're not wrong - because, as we age, we lose the ability to form new memories. This is not news; but what is new is that memory formation can now be observed through three different kinds of magnetic resonance imaging (MRI). And this ability may lead to better memory drugs and faster proof of their efficacy. A team of researchers from Johns Hopkins University undertook a study of memory formation of college age students as well as 60 to 80 year-olds while they viewed various pictures. Three types of scans were used to record the actions of the hippocampus in each participant as they viewed the pictures: a structural MRI to detect any structural abnormalities, a functional MRI scans to observe how different areas of the brain functioned, and a diffusion MRI, that monitored how well different areas of the brain communicated with each other during memory formation. In one of the activities, participants had to indicate whether they had already been shown the picture during the course of the study. Participants used the words 'new,' 'old,' and 'similar' to identify the pictures. The younger students were able to identify similar pictures more often than the older participants, who perceived similar pictures as identical to ones seen earlier and thus classified them as old. This signifies a degraded pathway or 'perforant pathway,' to the hippocampus, an area that can be targeted with drugs. Being able to view the hippocampus while subjects are making memories is a big step, not only in the full understanding of brain activity but to see first hand the efficacy of drugs during testing. Researcher Michael Yassa said of the results: "We are now closer to understanding some of the mechanisms that underlie memory loss with increasing age," Yassa said. "These results have possible practical ramifications in the treatment of Alzheimer's disease, because the hippocampus is one of the places that deteriorates very early in the course of that disease." "Basically, we will now be able to investigate the effect of a drug on hippocampal function and pathway integrity," he said. "If the drug slows down pathway degradation and hippocampal dysfunction, it's possible that it could delay the onset of Alzheimer's by five to 10 years, which may be enough for a large proportion of older adults to not get the disease at all. This would be a huge breakthrough in the field." The complete study is published online in the Proceedings of the National Academy of Scienes. Wake Up Seattle! Instant Starbucks Is Coming!